If you are like me and like to have your gadgets fully powered and ready to go at a moments notice, you will most likely be purchasing an Energizer Smart Charger. Yes rechargeable units have been available for quite some time now, but not with the capabilities and extra features this one has. Energizer’s new, sleek model has people going for the design alone. The perks of upgrading to this charger are pretty convincing. It does more than charge rechargeable AA and AAA batteries. It has a LCD display that shows how much of a charge the batteries currently have and a “fuel gauge” that shows the amount of time until you reach a full charge. It charges the batteries in a slow charge rate, which helps gives them a longer life and many more safe charging cycles for the batteries. It also features a bad battery alert on the LCD display, allowing people to know when a battery cannot be charged anymore because the life cycle is done. 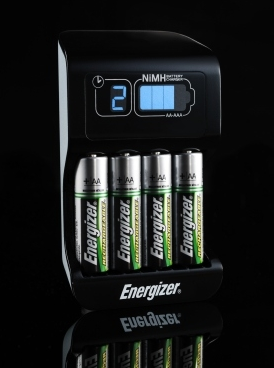 The Energizer Smart Charger prides itself on the ability of having their NiMH batteries be charged up to 250 times. The charger is also ENERGY STAR certified and uses microprocessor circuitry (things such as voltage, temperature and state of charge) to monitor specific battery parameters when charging. The Energizer Smart Charger is just $19.99 for the kit and includes four AA rechargeable batteries. You can find it and purchase on energizer’s website. I think I might just have to upgrade my battery charger. Great coverage – thanks!